Fussball_eh had the most liked content! Is that confirmed, that's it's general admission? Bunch of us bought tickets separately, just want to make sure we can watch the game together. I'll admit it, it's a bad tweet. It comes with the territory, when you give access to the twitter account to dozen different contributors all across the world, with varying abilities to speak English and perhaps improvable social media skills. Nevertheless, your comment on Valentines Day no less, is a perfect illustration of what a negative & viscous person you are, at least online. In all these years you have never said anything positive about the work we do at Canucks Abroad, yet you are always the first one to point out its faults, no matter how little. I hope your little stabs, and the resulting clicks of "approval" make you happy. But ask yourself, what has been your contribution to Canadian soccer? Has it helped grow the game, or at least the community here? In my view, it's people like you that make this forum such a toxic mess that results in many good people leaving. Luckily we now have more positive alternatives to find information, such as the #CanPL discord. It’s def no longer a one man’s job. With the increased availability of player data, so also comes the increase of players to be added (and to be maintained) on the database. Compared to those early lists we have exponentially more players to track. So I wouldn’t say the job is necessarily easier. Luckily the google document allows infinite people to edit at the same time, hence why I was so ademant that it’s a superior solution to a forum post. Although I admit, it may have lost a certain early 90s forum charm 🙂. We are currently looking for a dedicated volunteer to cover the French-speaking world to start, and possibly PLSQ (not required). If anyone wants to dedicate a lot of their time, and get little more than positive karma in return, please DM me ;). Did a little writeup about what all that means. It was nice meeting many of you in Toronto yesterday. See you at the next game! I hope it's fine to post the following message here. If you believe it doesn't belong on the V forum please let me know and I will ask the admins to remove it. After many years of running Canucks Abroad and this thread with a small team of dedicated volunteers (that include many Voyageurs) I have decided to launch our project on Patreon. Basically it's just an opportunity for stakeholders who use our services to give back financially to compensate us for the countless hours we have invested in keeping the database up to date and the twitter monster fed. Feel free to check out our Patreon page here: . Please note the database "Mother Of All Canadians Abroad List" will remain intact, and it's the exact same one we use on our website. 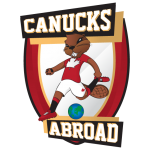 We've also updated www.canucks-abroad.ca recently if that's of interest. Some of you have heard that we launched a #CanPL discord a while ago. It's a little thriving community, feel free to check it out as well. Happy tracking and see you next Tuesday! Thanks man. It's a collaborative effort that includes many volunteers around the world and other stakeholders, including the Voyageurs. I just bought my ticket for the game in Toronto. Please stop by and say hi :-). This is the time of year where we see the most changes. We usually catch players joining new clubs, but our biggest challenge in keeping the list accurate, is catching all the players who have left their clubs. If you want to help, feel free to go through the MOACA list, and see if we got any wrong. Any help is greatly appreciated. I don’t want to derail the thread, but for the record, I wanted to move it to a google document (not my own website) instead of text in the forum, which by the way we ended up doing, and everyone is happy with the “new” format. This kind of attitude displayed by you (and others) pretty much sums up what is wrong with this forum for me in the first place. First of all, to pretend nothing is wrong at all, even when the man behind the platform is the one that started this thread, is simply arrogant. Second, the whole notion that due to the fact that you’ve been around longer you are somehow a bigger Canadian soccer fan, and therefore should dictate the culture around here, is very medieval. I’d like to refer people to the beginning of the MOACA thread when I took over from a few years ago, as an example how you should not treat newcomers, who may bringh new (and perhaps) improved ideas to the table.